The unique Jensen Vari Angle feature allows the flow stream to be directed to any area of the tank assuring complete tank cleaning. Jensen Vari Angle Mixers will completely remove sediment build ups from old tanks ! Jensen Vari Angle Mixers will guarantee freedom from manual tank cleaning. The Vari Angle feature is a precision, ball-type stuffing box allowing 60º angular movement. 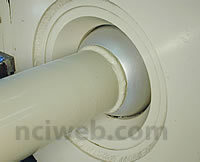 Sealing is accomplished by Teflon® impregnated non-asbestos packing which is fully adjustable to eliminate leaks. Mixer weight is supported entirely by two heavy duty, pin type hinges. As with all JENSEN Mixers no turn-buckles, tie rods, bases, or other extra supports are required. Angle changes can be made easily by one man, or automatically controlled by the optional Mechanical Actuator. The vari-angle feature of Jensen mixers has been proven to be effective for the resuspending of tank bottoms sediment. It does so by directing the propeller flow stream(s) toward deposits on the tank floor. In order for vari-angle mixers to be fully effective the entry angle of the mixers should be changed periodically. Jensen offers the mechanical actuator which assures that the mixer continually moves across its sixty degree entry angle, from left to right and back to left, over a period of approximately ten hours running time. Obviously, any mechanical device requires energy for its operation, however, the Jensen mechanical actuator consumes so little energy as to be nearly impossible to measure. It can be easily retrofitted to older mixers without concern for modifications to power sources. For more information please visit our site page "Reasons to use a Vari-Angle".